Is elevated cholesterol really a problem? In a word, absolutely! However, beyond that assertion, there is a lot about cholesterol that is little known or completely misunderstood. Elevated cholesterol levels feed the growth of obstructive plaques in the coronary arteries, and the higher the cholesterol levels, generally the more rapid the growth of the plaques. Cholesterol levels rise because they are one of the body's natural defense mechanisms against a wide variety of toxins. The higher the toxin presence, the higher the cholesterol goes to help block/neutralize the increased oxidative stress coming from those toxins. So, the more heart disease is aggravated as the cholesterol levels rise. But... you don't want to lower the cholesterol levels without lowering the toxin presence as well. Otherwise, you'll just have more un-neutralized toxins in the blood and in the body, causing increased oxidative stress and damage wherever they go. Then what do I do when my cholesterol is elevated? Isn't it good to take a statin drug just to make sure that my cholesterol stays nice and low? Not really. 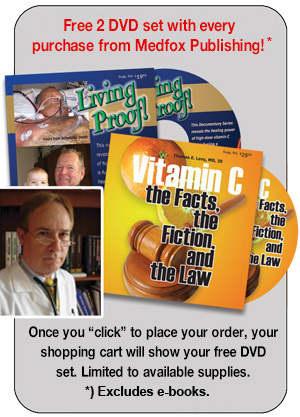 When just the elevated cholesterol level is treated with a statin and no attempt is made to lower toxin exposure and/or to neutralize existing toxins with antioxidants such as vitamin C, your chances of cancer dramatically rise. As a general guideline, when new toxin exposures have been properly addressed, and normal daily toxin exposures are all that remain, most adults will end up with a "normal" cholesterol level between 160 and 220 mg%. You never want a cholesterol level to chronically stay below 150 mg%. And what do I do if I don't want to take statins?